The Dominican story begins in the early years of the 13th century. It goes back to a preacher and a dream. The preacher was Dominic Guzman from Spain, and the dream was to be a follower of Jesus Christ by preaching the good news of salvation. To this end, Dominic started a preaching movement in southern France where he saw many people lost in untruth as a result of the Cathar (Albigensian) heresy. Among the first people to join him were some women whom he had converted back to the Christian faith . In the words of the last Master of the Order, Carlos Azpiroz: “at the beginning there was an itinerant preacher and a few Cathar women converts”. By degrees, this initial group developed and expanded, and several of the women made profession. And so the first Dominican monastery came into existence at Prouilhe, not far from Toulouse. As Dominic later moved from place to place preaching the gospel he shared his dream with enthusiastic women as well as men. Canonically, at that time, religious women were not allowed the freedom of movement open to religious men, but the women who were inspired by Dominic were as much a part of the ‘holy preaching’ as were their brothers in the Order. Agnes of Montepulciano was one of these women. She was born Agnes Segni near Montepulciano, a hilltop town in Tuscany, in 1268. From an early age she desired to give her life to God as a cloistered nun. There was no Dominican monastery in or near Montepulciano, (and possibly she was not acquainted with Dominicans at this stage) and so she joined another monastery in Proceno nearby where, by papal dispensation, she quickly became the abbess. In 1306, as a result of a vision, she and six companions founded a convent in Montepulciano, which became the monastery of Santa Maria Novella. At first it was under the jurisdiction of the local bishop, but as it was Agnes’ desire to belong to the Order of Preachers, it was transferred to the jurisdiction of the Friars Preachers. And so began Agnes’ Dominican life. She remained prioress until her death in 1317. As a Dominican Agnes helped many people in and around her hometown and she became known for her holiness. We hear that she was visited by the Virgin Mary who allowed her to hold the baby Jesus in her arms, and that often when she was praying, her mantle would appear to be covered with a shower of manna-like white grains. After her death Agnes became known as a miracle worker. Her body, which remained incorrupt, was widely venerated. In 1532 Pope Clement VII gave permission to the local people to celebrate a feast and an office in her honour: a permission that was gradually extended to other regions and the whole Dominican Order. In 1726 Pope Benedict XIII (a Dominican) canonized Agnes. Catherine of Siena (1347-1380) had tremendous devotion to Agnes. Possibly this arose from what she had heard of her holiness from Raymond of Capua, her Dominican friend and guide. Raymond spent four years (1363 -1367) in Montepulciano as the vicar of the Master of the Order for the nuns, and during that time he heard many moving and edifying stories about Agnes from four Sisters who had lived with her. Raymond later wrote a Life of Agnes of Montepulciano. Catherine of Siena visited the Dominican monastery in Montepulciano on several occasions in order to pray at Agnes’ exposed body. We are told that on one of her visits, as she bent to reverence the body, Agnes’ foot of its own accord lifted itself up to her mouth to receive her kiss! One of Catherine’s nieces, Eugenia, was a nun at the Montepulciano monastery. 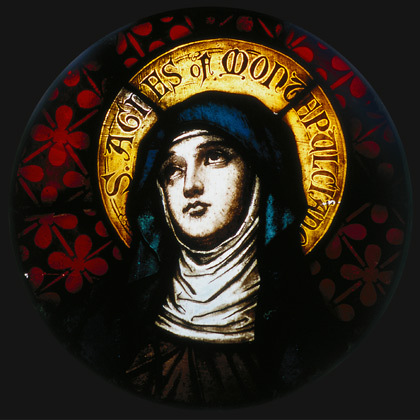 As we reflect on the life of Agnes of Montepulciano, we can appreciate that she was a Dominican woman who, according to the needs and possibilities of her time, shared Dominic’s mission to bring the good news of salvation to others.